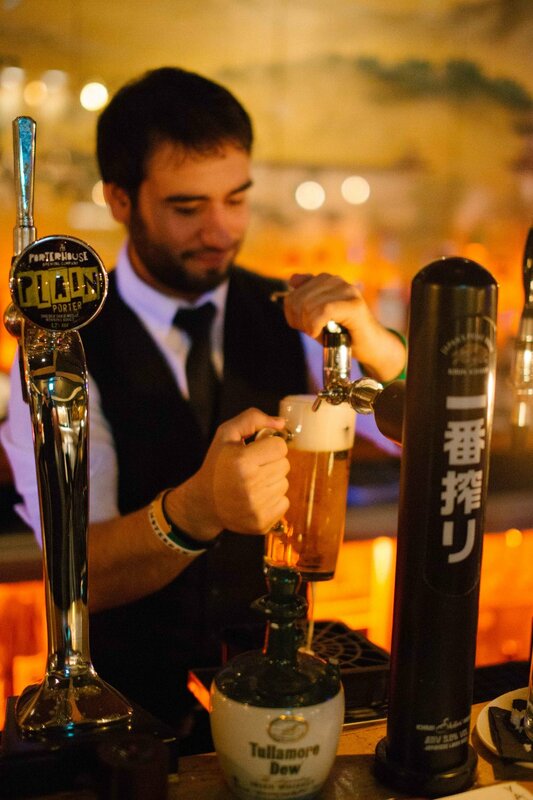 On 5 October 2018, Yamamori proudly launched The Whisky Bar at the North City location. An intimate space perfect for small parties and low-lit dining, the Whisky Bar is situated at the front of the North quays location, and completes the family of distinct spaces at the North City location that also includes the main Yamamori Sushi restaurant, Yamamori Tengu nightclub at the back of the venue, and Kaizen Bar located upstairs above Tengu. The Whisky Bar offers some of the world’s finest aged whiskies, with a particularly expansive range of Japanese whisky from top-rated distilleries such as Nikka, Yamazaki, Suntory, and many more. Single malts, limited editions, and unique blends are all available at The Whisky Bar, in addition to the usual food and drink menus. In addition to genuine Japanese artifacts and stylish decor, it also features a bespoke sound system, late-night acoustic and DJ sets, and a private smoking terrace. 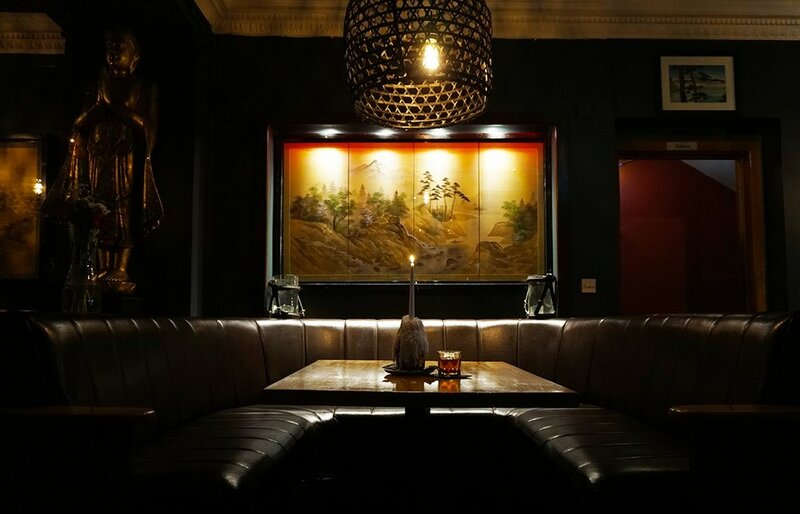 The Whisky Bar is available for private hire and takes group bookings, and is currently taking Christmas party bookings with set sushi and appetizer platter options available to order; for more information and to inquire for Christmas party bookings, please see here. And if sake is more your thing, come visit us on the Southside at Izakaya Sake Bar. Visiting Japan soon? Find out where to drink Japanese whisky in Tokyo (TimeOut Tokyo). The design vision behind the Whisky Bar was inspired by authentic Japanese cocktail bars, sultry and dimly lit spaces with a sophisticated air and top-notch cocktail selections. Graham Ryan, general manager of Yamamori and visionary behind The Whisky Bar, wanted to reflect this aesthetic while also referencing the traditional production process and taste of Japanese whisky: the rich smoky notes of aged wooden barrels, and the dark tones of singed barrel-top branding. Drawing on traditional whisky label designs and advertisements, the new signage and interior elements use old dark barrels with the Whisky Bar logo. A creative feature of the new space is a bespoke design developed and added to the prominent mirror on one side of the intimate space. 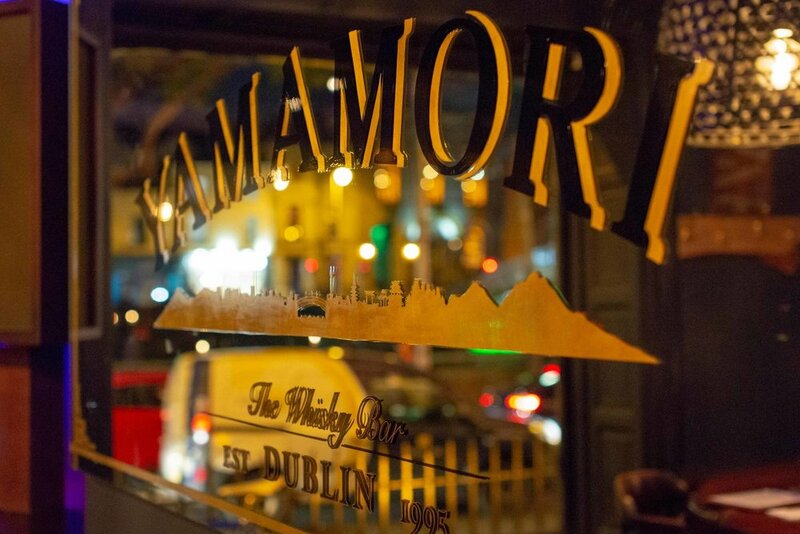 This concept brought together all the elements into a “classic pub mirror-style” design rendered in only black lettering and gold leaf, with the Yamamori signature logo symbol anchoring each of the four corners, and a nod to the establishment of Yamamori in 1995. The centerpiece landscape illustration depicts the Dublin and Kyoto skylines linked at the centre by the Ha’penny Bridge - the iconic Dublin City footbridge situated, incidentally, right at the steps of Yamamori on the northside quays. This global connection of culture, tradition, and imbibement is at the heart of The Whisky Bar. This piece was creatively directed by Graham Ryan, designed by illustrator Clara Dudley, and applied by signpainter Cormac Dillon (@macksigns).